The IntelliShape display has been improved to allow transparency display for better visual appearance on modifications. With the improved highlight, you can visually see the geometry of the shape to improve the visibility when making modifications to features. This is an options setting that can be disabled to revert to the traditional display. 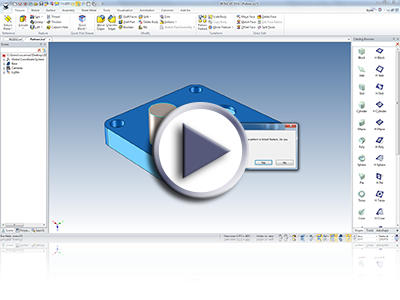 This functionality allows parts and assemblies to be automatically applied to existing patterns and links that exist as features on another part. 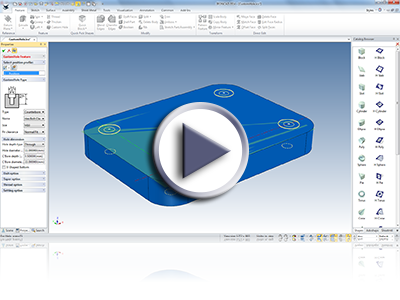 To use this, simply drag and drop a part or assembly onto an existing pattern or linked belonging to a part and the new component will automatically take on the properties of the link or pattern. This functionality can be turned on or off in the Tools/Options menu. Ever have the need to modify multiple features in the same direction? Now you can simply select multiple features and pull a handle displayed from any of the features, and all features will modify that can modify in the pulled direction. For example: Take a sheet metal part box with bends. Simply select the stocks and the bends and you can pull one handle to have everything maintain and adjust together. This new intelligent behavior lets you select multiple features and pull a single handle to edit all the selected features in the same direction applying the same modified distance. In many cases, you may want to modify a set of features using the same distance and this new behavior allows for this quick modification. Note that this works for Sizebox handles only (and sheet metal stock, bend handles and bend radius) and the handles only in the same orientation will be modified. To use this, simply select multiple features with the shift key, then select the a handle you wish to move. This functionality allows you to set the default handle for editing when you drag and drop a feature from the catalog onto your design or select the feature during edit. 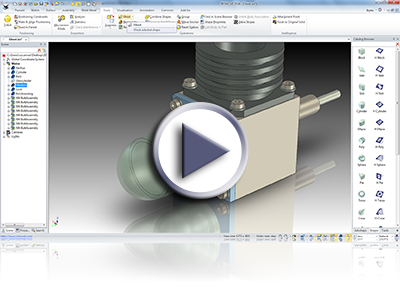 For example when you drag and drop a cylinder onto a part you can set the default handle for editing to the width handle. When you drop the cylinder onto a part the width handles value is automatically highlighted so you can quickly edit its value by simple typing in a new value. 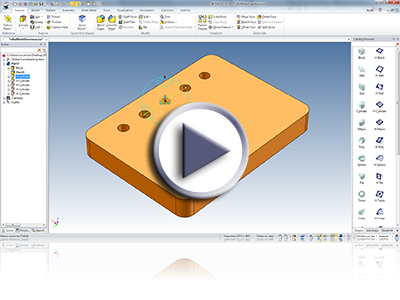 This functionality allows you to “ghost” parts. A ghosted part is transparent in the scene and cannot be selected, however a ghosted part can be used for referencing when doing such things as resizing other shapes or positioning an item with the TriBall (optional). Since the part is transparent (which is controllable setting) you can reference both the edges of the ghosted shape and also other geometry through the ghosted part that would normally be hidden by the part. 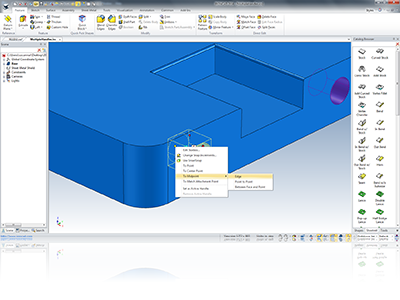 This functionality gives you the ability to automatically create constraints when dropping parts onto one another. The constraints will be applied speeding up your design time. The option can be turned on and off in the Tools/Options menu. 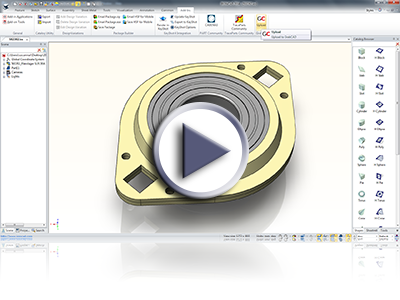 A powerful enhancement now allows you to smart snap to one cylindrical surface to another. Previously you would have to snap to a quadrant point. This makes sizing cylinders much faster. 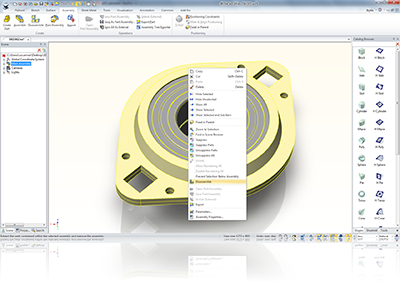 When you have multiple parts selected you can easily assemble them by simply right clicking and choosing Assemble in the menu that appears. This reduces mouse clicks and speeds up design as you do not need to toggle to the Assembly menu to apply the Assemble command. Similar to the functionality listed above, to disassemble an assembly simply right click on it and choose Disassemble. User now have the ability to wrap text objects or multiple looped sketches to be embossed on a planar or cylindrical surface. This is useful for engraving text on products for example. This curve type is used for operations such as a spin shape to define the spin axis. 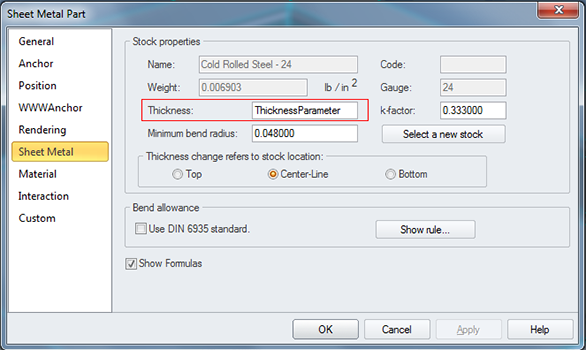 You can now drive the thickness and direction of sheet metal shapes via a parameter in the design. 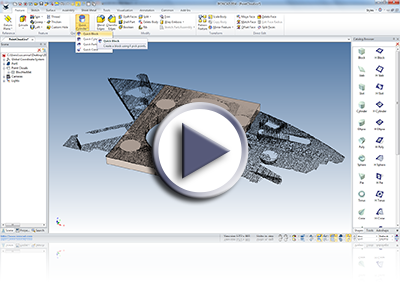 This powerful functionality means you can quickly an easily change the stock thickness of multiple sheet metal parts as the same time. You can now change the angle of a bend and the bend length will maintain its length. Previously the length would change and you would need to re-edit the length. This enhancement removes the need to have to do this extra step. You can now edit the standard sheet metal stock settings directly in the Tools/Options/Sheet metal window. Previously you would have to manually edit the Tooltbl.txt text file which was slow and cumbersome. The Tooltbl.txt file can now be hosted on a network drive for easier management of your standard sheet metal stock shapes. The Custom Hole tool (in the Feature ribbon bar) now supports the ability to drop on special points on geometry such as center/end/mid points instead of only 2D Sketch defined point. In addition, during this command, you can define multiple point locations to create many holes in a single command feature reducing the need to create patterns or multiple features after the initial hole creation. The ESC key can now be used to cancel the TriBall Copy/Link process when creating many copies/links that may have been accidently initiated. When using the Direct Face Modification commands, using the option “Apply to Intellishape” has new intelligent capabilities to maintain the edited features original definition (sketch) if the modification is possible by altering its definition. This provides the user with more control in modification and maintains design intent when it may be unnecessarily lost in Direct Modifications. Did you ever find it hard to locate a shape within an assembly in the scene to add to a catalog? Now you can simply select the shape in the scene browser and drag it directly to the catalog without the need to locate it in the scene. When Translating and Rotating with the TriBall using the Right-Click, a new option is available to repeat in both directions (bi-directional). This allows for quick copies of geometry about a midpoint location. Rotate an object by To Point and Right-click to get Link/Copy menu. Similar to drag but using an orientation handle. Refer to center-point copy behavior as an example. On the Sizebox IntelliShape handles, a new option has been added to access the middle point (similar to TriBall to Middle Point). Note behavior has changed to allow plane and point instead of Plane-Plane. 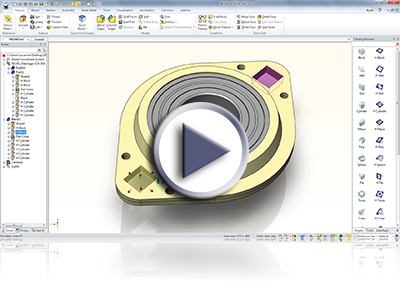 General improvements in the creation of view in CAXA DRAFT for large assemblies. You will see speed improvements of approximately 15% in general cases. If your model contains parts all set to the Parasolid Kernel, the improvement in speeds can be up to 80% in projection and sectioning. We have fixed an issue where the update may be slower than the projection speed. This reduces the number of clicks needed to get to the 3D Interface Tab and speeds up drawing creation. 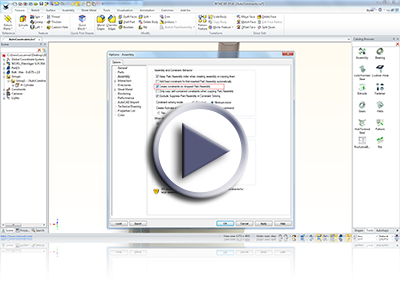 This allows a user to view and change the scene file associated with a particular drawing file. For example: Users could create a general layout template and update the scene link to update the views with new projected geometry. The view tree has been made the default instead of the mechanical libraries. This was due to feedback from customers that they spent more time in the tree view. Minor enhancements that include Rename Whole to All Parts, Default Setting for Default Configuration, Drop Down for Configuration Name Expands for Full Length of Name. Detail views now are supported on Broken-out section views. Detail view association has been improved when modification to the original geometry is performed. The detail views in this case will attempt to maintain association to the geometry modification. 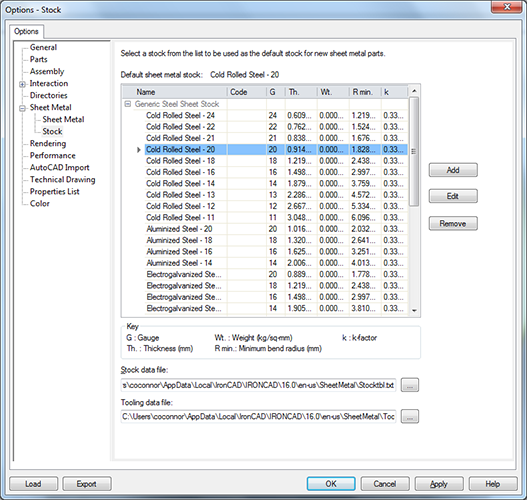 In the IRONCAD Drawing (ICD), select a view and the Property Browser will show setting for the View Display Type to allow quick change from Quick, Draft, and Precise. When you are in a sketch using a command like Move, the Sketch Finish command will be disabled to prevent the accidental completion of the sketch which exits the current active command. With the growing usage of the intelligent parts for configuration, more capabilities are being added to improve the usability. 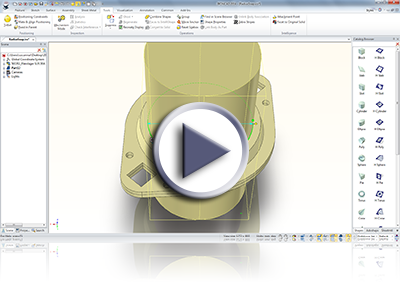 In 2014, users can snap handles on features/parts to matching attachment points on other parts for quick alignment needs. For example: An extrusion part can use a handle to snap to a mating part with a defined offset stored in the attachment point locations. Quick access to the select and box select commands have been added to the status bar. New options to quickly unsuppress all parts/assemblies under the selected level (filtering down into the sub levels as well) has been added. This reduces the time needed to manually unsuppress components and sub-components of assemblies. Improvements have been made to the Feature Modification commands when Cancel has been selected to reduce unnecessary regenerations. The Selection Tool (for certain surfacing commands) has been improved for additional loop detections. Also, the command has been enabled for the following additional commands: Blend/Chamfer, Draft, 3D Curve Projection, and Extend Surface. This command is access using the Alt-A keyboard accelerator. Improvements have been made to the general 3D solid/surface import command. 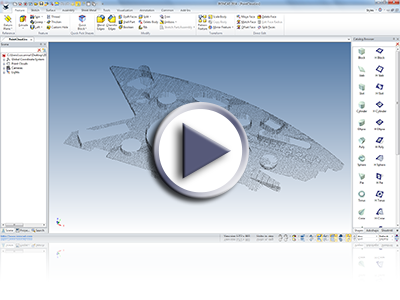 The Measurement command has been improved to allow selection to Datum Planes on Structured Parts. This allows users to get dimension measurements to these reference planes for improved communication. Support has been added to structured parts to support the split command using multiple bodies. 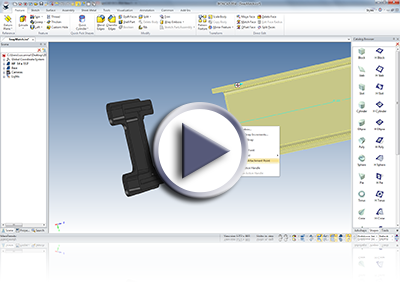 Similar to the Trim Command, users can select the source body and the splitting element/body. The final result will create additional bodies that represent the split regions. 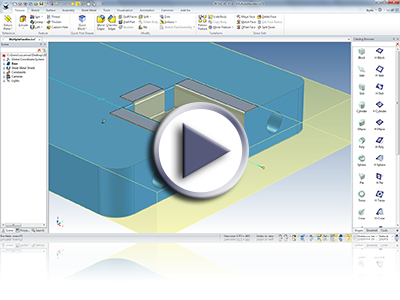 Users can use these bodies to perform additional operations and modifications while maintaining association to the original feature design intent. 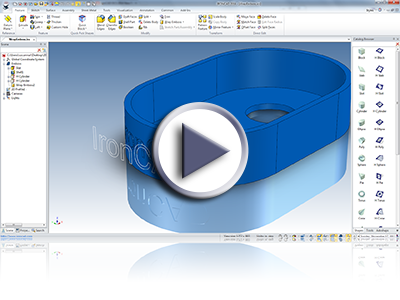 Leverage your scanned data by importing into the IronCAD Design Collaboration Suite! Using an optimized drawing display, you can import and display large data sets that can be used as reference to recreate or build geometry. Currently supported formats are .pts, .ptx, and .xyz. With the growing usage of scanned data whether point cloud data or facet data, you need improved tools to recreate or construct geometry from reference locations quickly. Even though our drag & drop catalog interface is far better than the traditional applications of the sketch driven process, we believe there are faster methods not fully available in the market today. Check out the new Quick Creation Tools that allow users to pick reference points (these can be point cloud points and/or existing solid data points) to define the shapes. We have started off with the basics supporting blocks, cylinders, cones, and partial cones. COMPOSE allows user to configure product data using catalogs which protects IP by using only graphical representation data. Now you can collaborate more effectively by taking COMPOSE configured data and converting it into real solid data using IRONCAD for more advance communication, modifications, and design negotiations. Once modifications are complete in IRONCAD, send the final representation back to COMPOSE for extended communication. This works for IRONCAD/INOVATE created Catalog content shared with COMPOSE. This will be a new option in the dialog prior to activating a license. When exporting an image based on the current scene display, the export command has been update to support larger scales which were previously limited in size. You can now select export when nothing is selected to export into solid formats. In the past, you would have needed to understand to select a part first or you would only have access to graphical formats. Now we will handle this case by selecting the top-level assembly in the scene or automatically create the assembly on export. The sketch environment has been updated to enable the 2D Curve Dimension by default allowing user the ability to directly see the dimensional information on selected curves immediately. When in the Position TriBall Only Mode (spacebar), the right-click action for move here is enabled for translation and rotation for consistent operations of the TriBall. During rotation of the TriBall, the display has been improved to only show positive values from the start directions (either direction) to reduce confusion. The value will always be 0-360 from the starting location (not 360-0 and 0-360). 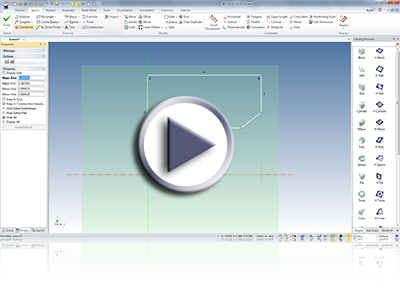 Create 2D Sketch SmartDimensions but unlocked. Simple new option in Property Browser when creating a SmartDimension to create an unlocked dimension. 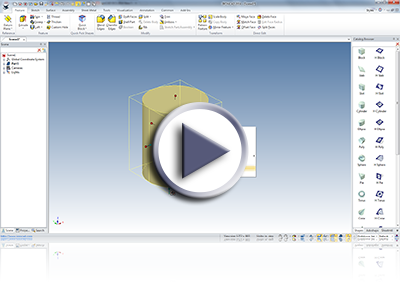 When nothing is selected in the scene, a default kernel type option has been added to the Property Browser to allow quick change for new parts or imported geometry. Heavy focus has been added to the quality and stability of the products. Users should experience an improvement in reliability using the new 2014 version. IronCAD Design Collaboration Suite has been tested and certified to support Windows 8 and 8.1. Updates to the Parasolid kernel have been implemented. These updates include various improvements to the modeling geometry as well as support for new versions. Files up to version 25.1 can be imported and exported. Updates to the latest version of the HOOPS toolkit allows users to export and share IRONCAD scene files in the latest HSF format (19.34). This allows users to share data with other applications such as a viewer while taking advantage of the latest visual and performance improvements. Many import/export options available in IronCAD Design Collaboration Suite (including IGES and STEP) have been updated to the latest versions offered from Spatial’s InterOp version 23 SP 2. 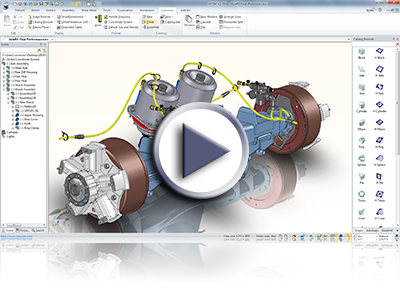 This update improves the reliability of the import/export interoperability between CAD systems. 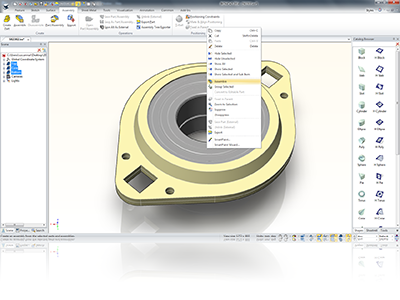 In addition, the Native Translator versions supported in the Translator Bundle have been updated to support the following new versions: Inventor 2013, Creo 2.0, SolidWorks 2013, Unigraphics NX versions 11 to 18 and version NX1-NX8.5, and CATIA V5-V6 supports Read versions R6 through R23 and Write versions R6 through R23. Constraint Solver upgrade for improved reliability and improved performance. To improve customer experience in downloading and using our applications, we have made improvements in the License Activation Wizard to clearly guide you to register license, see current licenses, and other processes. The Rhino-IRONCAD integration has been upgrade to support Rhino 5 which also allows 64-bit support. You will be able to connect directly to Rhino to transfer feature data between IRONCAD/INOVATE to edit directly within Rhino. Once editing is complete, updates can be sent back to IRONCAD/INOVATE to reflect the changes while maintaining associative references. Using the latest version of the IronCAD Design Collaboration suite, you will be able to share your design work to the GrabCAD community. Simply select the upload command and the IronCAD data, preview image, and a Parasolid X_T file (when solid data is present) will be uploaded to your community folder or project in GrabCAD. This allows you to extend your collaboration with others within an community of designers. 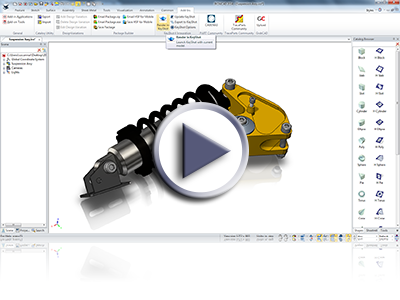 You will now be able to connect freely to the TraceParts product community directly from within the IronCAD Design Collaboration suite. Browse, download, and import back into the suite to enhance your design process. The IronCAD Design Collaboration Suite includes both real-time and realistic rendering options, but we see that some users prefer the KeyShot rendering capabilities to complete their product representations. Therefore, we have add the KeyShot Integration to allow you to transfer your designs to KeyShot (needs to be installed on your machine). Materials and renderings can be performed in KeyShot and when changes to the geometry occurs in the IronCAD solutions, the data can be updated in KeyShot using the Live Linking capability.